As of September, 2016, the Office of Sustainability has partnered with the USSU Sustainability Committee to provide sustainability grants to University of Saskatchewan students. The committee's enhanced funding capabilities, increased oversight, and student leadership makes it the perfect way to help U of S students fund their sustainability-related projects, intiatives, or events. To apply for sustainability funding, please apply online at the USSU Sustainability Committee's web page. To make sustainability funding even easier on students, we've made a pre-made set of packages that ratified student groups can take advantage of through the USSU Sustainability Committee. Contact the Office of Sustainabilty for more information on these packages. Food for the Future is a continuous project led by EnactUS University of Saskatchewan, a team of student, academic, and business leaders from across the province who use entrepreneurial action to create a better and more sustainable Saskatchewan. The project is an Indigenous community garden project that addresses food insecurity in Northern Saskatchewan by connecting community champions with funding and education to start and sustain community gardens. Beginning in 2015, the group started a garden in Beauval consisting of 15 raised bed gardens. In addition to starting the gardens, EnactUS brought in gardening experts from Saskatoon to help lead educational workshops on healthy eating and effective gardening. Its second season saw an expansion into St. George’s Hill and Pelican Narrows, both communities that had suffered from the lack of nearby grocery stores. Food for the Future is now in its 3rd year of operation and has expanded to the communities of Dillon and Cumberland House. In 2018, the USSU Sustainability Committee’s contribution of $2,000 helped the group continue its existing operations and expand into new territory: indoor hydroponics. By connecting with a group from Memorial University in Newfoundland and Labrador, the group hopes to identify portable, indoor hydroponics gardening solutions to enable community gardening projects in northern Saskatchewan communities even during the winter months. The U of S Aero Design Team was funded again in 2017/2018 for two separate but related requests. Their balsa wood plane design has been presented and tested in international competitions for years now and serves as a demonstration concept for lightweight, fuel efficient aircraft made of sustainable materials. Their requested funding went to sourcing sustainably produced balsa wood and new electric components intended for reuse to ensure that the plane designs stay fuel efficient for years to come. Ducks Unlimited Canada Saskatoon Chapter is a student group chapter of Canada’s longest-running wetland preservation group. The group was funded by the USSU Sustainability Committee in the 2016/2017 academic year and received further funding in 2017/2018 to assist in new construction and the maintenance of previously constructed waterfowl nesting boxes and platforms along the banks of the South Saskatchewan River. The boxes will provide bedding and safety for hens and ducklings to safely lodge. U of S student Teresa de Hoop received funding from the USSU Sustainability Committee in 2018 to help build a clay oven for Opaskwayak Cree Nation's community garden. This oven will help in teaching cooking techniques and community-building exercises centred around community gardening. The Planning Students Association succeeded in obtaining USSU Sustainability Committee funding for their third annual MOMENTUM student planning conference. The conference ran for its third successful year in March 2018 and included topics on active transportation, environment and food security, planning for growth, and planning with Indigenous communities. Committee funding went towrads helping to provide sustainable food and event planning for their conference dinner. The Nursing Students Association in co-ordination with the Saskatoon YWCA held a series of workshops and related projects that provided members of Saskatoon's core neighborhood communities valuable resources and information related to finding health professionals. The Environmental Engineering Students Association received funding in 2017/2018 to initiate a sustainably-run student coffee operation in the Engineering Building. The Building is one of few on campus without a coffee vendor located within and the student group took it upon themselves to offer a weekly coffee sale which provides FairTrade certified coffee and locally-made donuts to students. The initial funding went to providing signage, coffee, and donuts for the first event, with profits returning to the club to support future sales. The Mindful Living Club is a student group that gets together regularly to practice yoga, meditation, and community discussion in an effort to encourage mindfulness and positive mental/emotional health outcomes. They received funding in 2018 from the USSU Sustainability Committee to purchase yoga mats for open use by their current and potential members. The Environmental Studies Students Association (ESSA) received funding in 2017 to host an environmentally-themed documentary film night. Funding went towards licensing the film for screening and providing snacks and refreshments. Film nights like this help to engage the campus community in environmental issues and to raise awareness and membership of sustainability-related student groups. Beginning in 2015, the group started a garden in Beauval consisting of 15 raised bed gardens. 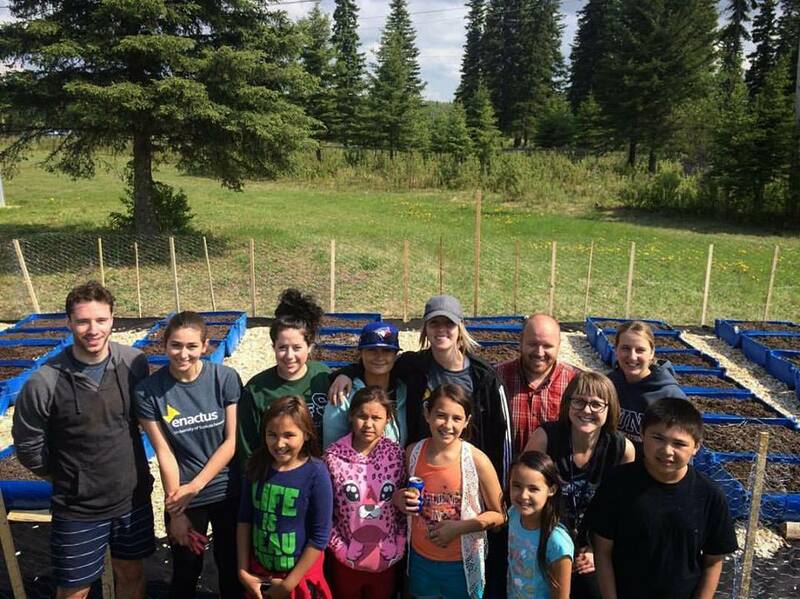 In addition to starting the gardens, EnactUS brought in gardening experts from Saskatoon to help lead educational workshops on healthy eating and effective gardening. Its second season saw an expansion into St. George’s Hill and Pelican Narrows, both communities that had suffered from the lack of nearby grocery stores. Food for the Future is now in its 3rd year of operation and has expanded to the communities of Dillon and Cumberland House. The USSU Sustainability Committee’s contribution of $2,000 helped the group begin the process of moving from community gardens to community greenhouses in order to expand the growing season. 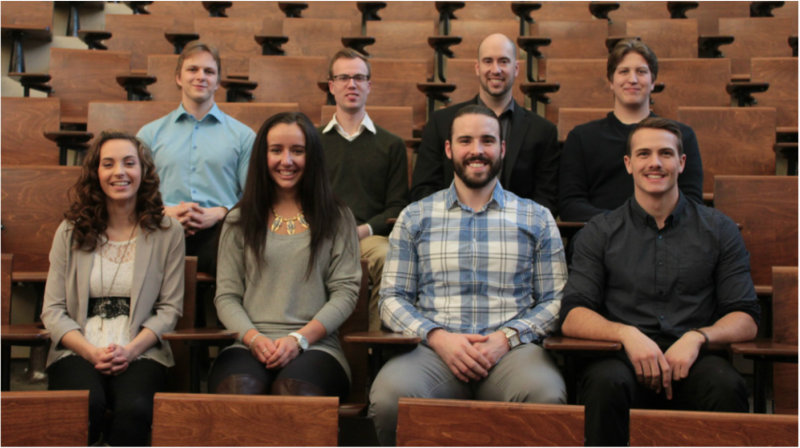 The University of Saskatchewan Innovative Energy Team (USIET) is a student group based in Saskatoon, Saskatchewan focused on designing and building unique and creative energy systems, from solar to conventional fossil fuels. USIET hopes to inspire and challenge its members to look beyond their previous experiences to develop an intrinsic understanding of energy, innovation and design to create the next generation of thinkers to help maintain Western Canada's place as a global energy center. The USSU Sustainability Committee funded USIET for $200 to have one of their groups design and implement a hydroelectric downspout turbine to generate electricity from rainwater flowing through a downspout at the Engineering Building. The build was a proof of concept to show that this simple technology exists and to demonstrate how it could be used at everyday places like the university. Green Legal is a University of Saskatchewan environmental law group that aims to increase environmental awareness and involvement within the College of Law, build environmental law and policy analysis skills among members, and support community-based non-governmental organizations through law and policy research. Just Rights is a student group also based out of the College of Law that focuses on educating the campus community and raising awareness regarding human rights. 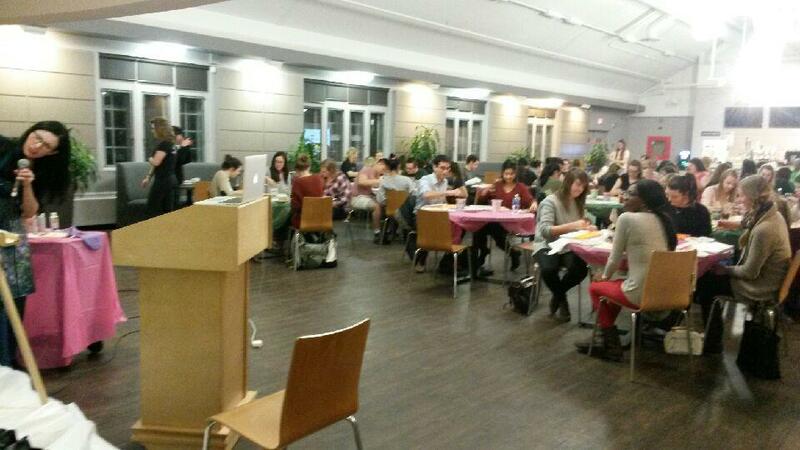 With help from the USSU Sustainability Committee, Green Legal and Just Rights were able to hold a paint night fundraiser for EcoJustice, Canada’s only national environmental law charity that provides funding to lawyers to use litigation to defend and protect the environment. Extra steps were taken to ensure that materials for the night (including the paint) were locally sourced and kept waste to a minimum. 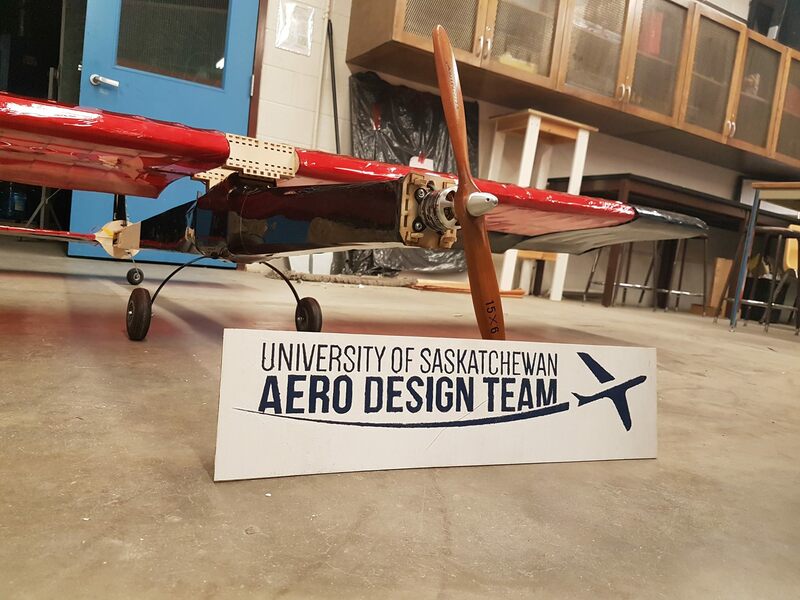 University of Saskatchewan Aero Design is a student group open to members of all U of S disciplines that teaches members about the mechanics of flight through designing competition-ready planes. The group received funding from the USSU Sustainability Committee to design and build a lightweight balsa wood plane for the SAE Aerodesign East competition, demonstrating a lightweight and energy efficient airplane design made from sustainable materials. The Planning Students Association succeeded in obtaining USSU Sustainability Committee funding for their second annual MOMENTUM student planning conference. The conference ran for its second successful year in March, 2017 and included topics on active transportation, environment and food security, planning for growth, and planning with Indigenous communities. ENVS 401 – Sustainability in Action is an undergraduate course at the University of Saskatchewan that offers the capstone project portion of the Undergraduate Certificate of Proficiency in Sustainability. Each year, student groups in this class choose sustainability-related projects on campus to pursue and present on them at a symposium held at the end of the year. 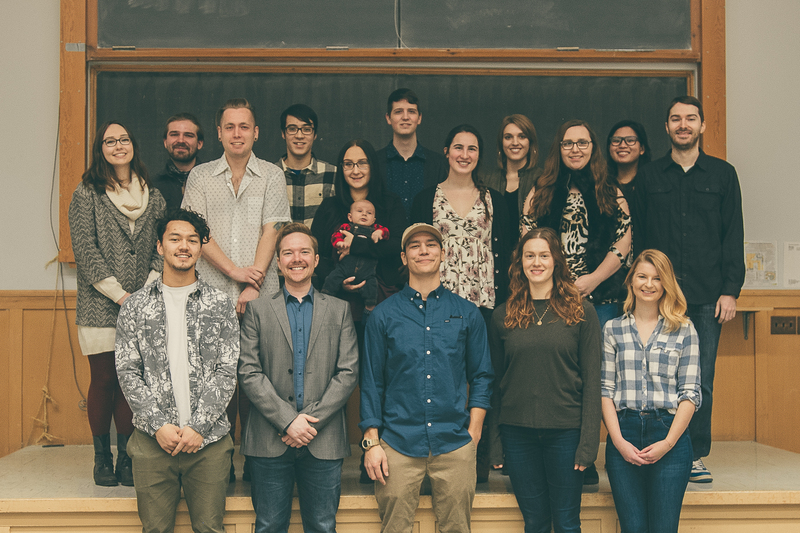 This year, one of the course’s groups approached the USSU Sustainability Committee to obtain funding for their project intended to increase awareness and interest in bee-friendly areas on campus and in Saskatoon. The group used the money to purchase two flower planters to be placed at the south end of the Bowl paired with informational signage on the importance of bees. Free seed packets would also be made available at the planters, which are used to create an educational opportunity for students, faculty, staff, and the general public to learn and interact with bees and bee habitats. Ducks Unlimited Canada Saskatoon Chapter is a student group chapter of Canada’s longest-running wetland preservation group. The group was funded by the USSU Sustainability Committee to construct and place a series of waterfowl nesting boxes and platforms along the banks of the South Saskatchewan River. The boxes will provide bedding and safety for hens and ducklings to safely lodge. The Office of Sustainability still offers student grants in smaller amounts directly to student groups looking to fund sustainability-related initiatives, programs, or events. Applying groups may now be referred to the USSU Sustainability Committee at the discretion of the Community Engagement Co-ordinator. If you would like to apply for a student group grant for your initiative, event, or activity, follow the link below. Purchasing reusable dishware for student lounge areas to reduce waste. Purchasing of film screening rights and refreshments for sustainability-related documentary film nights. 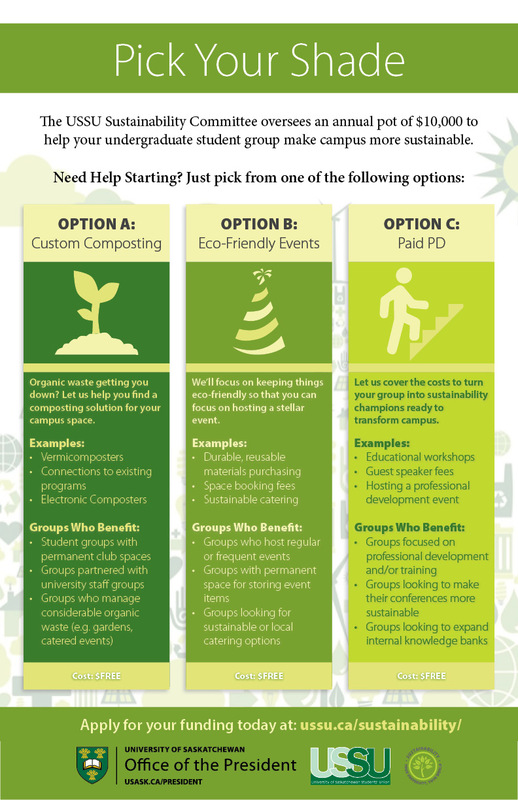 There are lots of ways for your group to engage with sustainability on campus! Remember, sustainability is environmental, economic, and social in nature; any group on campus can apply for these grants and there are many ways to engage with sustainability outside of environmental reasons.